Text If 2 or more cards are in the same column, you can Special Summon this card (from your hand) in that column. You can only Special Summon "Mekk-Knight Purple Nightfall" once per turn this way. (Quick Effect): You can target 1 "Mekk-Knight" monster you control; banish it (until the Standby Phase of your next turn), and if you do, add 1 "Mekk-Knight" monster from your Deck to your hand, except "Mekk-Knight Purple Nightfall". 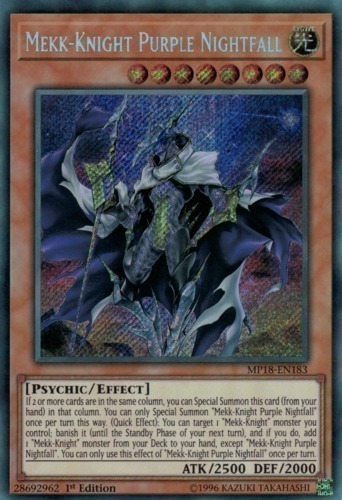 You can only use this effect of "Mekk-Knight Purple Nightfall" once per turn.